I bike commute. Every day, I get on my bike and ride from one end of San Francisco to the other and back again, usually with my 13-inch MacBook Air in tow. Sometimes it's scary, sometimes its cold, but it's always better than squeezing into an overcrowded, tin can of a bus that tops out at 5MPH. While looking for gadgets to make my 14-mile round trip safer, easier, and more fun, I came across the now-successful Kickstarter campaign for the $129 Halo Zero messenger bag. 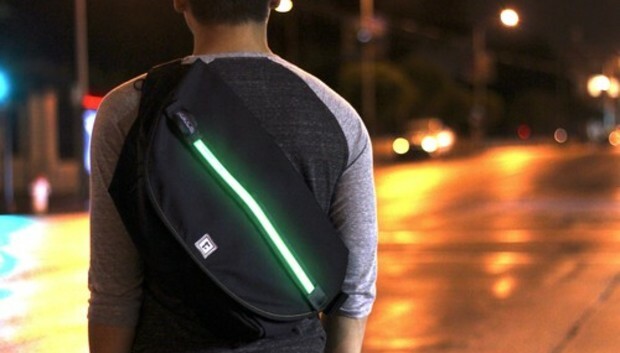 Designed by the experienced bag makers at Rickshaw, the Halo Zero combines the comfort of a traditional bike messenger bag with the added safety of an LED strip. Visibility is a major issue for urban cyclists: Even with top-of-the-line bike lights illuminating my bike frame, it's still a challenge to be seen by drivers when sharing the road with brighter and faster-moving vehicles. The beauty of the Halo Zero is in its huge, Velcro-attached LED strip that can be set to strobe, flash, or solid. With the extra light, I felt much safer on the road. Another fun aspect of the strip is that it resembles the tail lights on modern Dodge Chargers--a fun bonus that made me want to say "vrrooom" as I rode around town. While my primary concern on my bike may be safety, I also need to think about the safety of the cargo in my backpack. Even when you're practicing safe cycling, you never know when the train tracks will catch your front wheel in order to acquaint you with the pavement at high velocity. The Halo Zero is a bare-bones bag. It has one large main compartment and two outer pockets that are covered when the bag is closed with a Velcro-secured flap. However, it doesn't provide extra protection for your laptop. If you already keep your computer in a protective sleeve or hard-shell case, this may not be an issue, but others may find it to be a deal breaker. An optional 13-inch Velcro sleeve can be purchased for $19 and secures to the Halo Zero's soft Velcro strip in the bag's main compartment. What the Halo Zero lacks in laptop protection, it gains in comfort. Its absence of zippers and cushions makes it incredibly light, even when packed full with all of my work necessities. I found the positioning of the strap to be very comfortable. It can be adjusted to be worn tight on my back--a necessary feature to keep the bag off my moving hips while I bike. While it fit my 6-foot-tall body perfectly, my 5'4" friend found it a little loose even on the tightest setting. The strap can be worn on either shoulder with ease and has a quick-adjust release so you can take it off quicker than Clark Kent can get changed in a phone booth. Overall, I found the Halo Zero to be a comfortable, functional, and very well thought out product. Its simple design keeps it easy to carry and the LED lights stayed bright after two weeks worth of bike commuting (if the strip does go dark, you can just get two fresh CR2025 batteries.) All you need is a laptop sleeve and a bike.